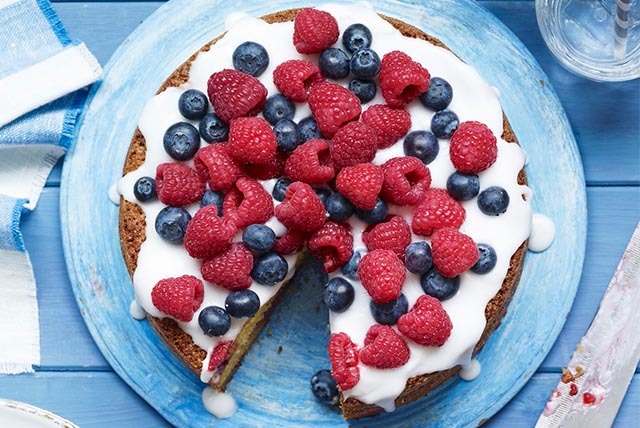 Our berry tart recipe is easy and delicious, but the best thing about this berry tart is that it's meant to be rustic, so don't worry about making picture-perfect edges! Dessert just got a whole lot easier. Beat 3/4 cup sugar and butter in large mixing bowl until light and fluffy. Add egg and mix until well blended. In separate bowl, combine flour, cream of tartar and baking soda. Add to butter mixture and mix until just blended. Press dough onto lightly greased baking sheet. Bake for 10 to 15 min. or until lightly browned. Cool 15 min. Remove from baking sheet onto serving platter. Meanwhile, beat cream cheese, remaining sugar and vanilla until light and creamy. Spread onto crust. Top with berries. Substitute 2 cups of your favourite sliced fresh fruit for the mixed berries.